Many gluten-free snacks leave quite a lot to be desired. They may have a really dull or unappetizing flavor, or their texture just doesn't appeal to you. Snackle Mouth, however, is what all gluten-free snacks should be. With so much flavor and crunch packed into each and every bite, it's hard to stop reaching for more. Out of all of the snacks (sweet, salty, or savory) that I have ever tried, I can honestly say that Snackle Mouth is, by far, my all-time favorite. While eating Snackle Mouth, I found myself caught between two physical states. The first was wanting more because I was addicted to the snacks' delicious flavors. Once I started eating Snackle Mouth, I found it really hard to stop. While I love all three varieties of Snackle Mouth that I was fortunate to try (Almond Pecan Maple Clusters, Almond Berry Clusters, and Salty Chocolate Clusters), I have to say that I probably ate the Almond Berry Clusters in record snacking time. They were just so good and tasted slightly like a delicious blueberry muffin. The second state I found myself in and feeling like I should stop reaching for more Snackle Mouth pieces because I was full and satisfied. Because these snacks are all made with oats and oat bran, they're really filling. But I think it was the combination of these ingredients and the snacks' texture that made them truly satisfying. Upon first bite, each cluster is incredibly crunchy. However, there's a pleasant chewiness that follows, thanks in part to the dried fruit in two of the snack varieties. So, because they're made with oats and they're crunchy, they make my body feel fuller faster (which is great because I'm the type of person who could snack all day long). I cannot recommend these Snackle Mouth products enough (even to non-gluten free folk) and will surely be on the lookout for these snacks every time I go to the store. 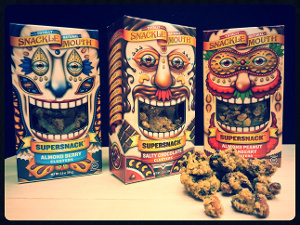 If you love delicious snacks, I definitely suggest that you try a box of Snackle Mouth. Im sure you'll love it as much as I do.